Attendees at Sunday’s fundraiser hold their high heels. More than 90 people participated in the Walk a Mile in Her Shoes fundraiser to raise money and awareness for survivors of sexual violence. Men donned high heels and walked alongside women and children Sunday morning at an event to raise money and awareness for female survivors of sexual violence. Evanston’s fourth annual Walk a Mile in Her Shoes fundraiser was organized by the Northwest Center Against Sexual Assault, an agency that provides free services to survivors and their loved ones. More than 90 participants walked a mile across Centennial Park. Northwest CASA will use the money raised Sunday to support its services, such as free counseling and court advocacy for survivors. Daley said the fundraiser will help the organization grow and better help its clients, including those in Evanston. 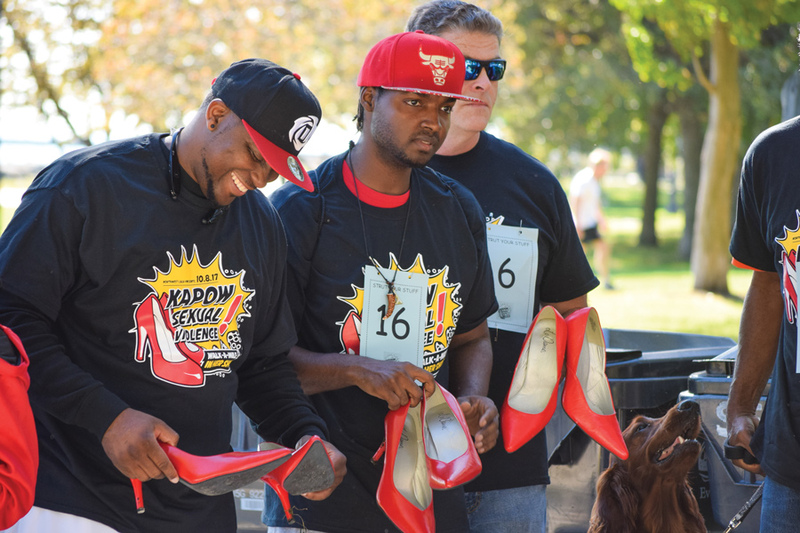 Volunteers distributed red high heels in men’s sizes to the event’s male participants, while women and children walked a mile in their own shoes. At the event’s start, participants walked through clotheslines with shirts displaying written messages from sexual assault survivors. The lines were held by members of Evanston Township High School’s Child Abuse Recognition in Evanston club. Northwest CASA’s executive director Jim Huenink told The Daily that although there are males who are survivors of sexual assault, the goal of the event was for men to show they are allies of female survivors. Ald. Peter Braithwaite (2nd), who has walked the event all four years it has been held in Evanston, told The Daily the walk keeps the community aware of the fact that most violence against women is committed by men.